When you travel the country with a truck and a trailer, it’s a lot of getting in and out of both. There’s no way to stop dust and dirt from entering with you, so if you want both spaces to stay somewhat clean, it’s a weekly chore. A big vacuum cleaner in a house that has its own space is great, but it becomes very impractical when you live on the road. My wife and I decided to buy a portable handheld vacuum cleaner so we could quickly go through the truck and trailer when needed and I have to say, we clean more often and our spaces look cleaner more often. I am somewhat of a clean freak, so the fact that I can quickly go through the trailer with it has made me a more happy camper. Today I would like to share the best portable handheld vacuum cleaners on the market today for cars and pets, I own one of them so I know what makes it great and not. The Scorpion from Dirt Devil is a neat little handheld vacuum cleaner. Although corded, it’s portable with its 15 ft cord. Since it weighs only 3 lbs, it’s one that would be easy to use in all kinds of places like the car and smaller places inside the RV. A quickflip crevice tool will let you get into the tightest spots. You can easily tell when the vacuum is full and with the touch of a button the dirt cup comes off so you can easily dump it in the trash. The filter in the dirt cup is easily cleaned with some warm water, and it’s recommended to do this every time you empty the dirt cup. Keeping the filter clean makes sure the suction power will stay as powerful as possible. 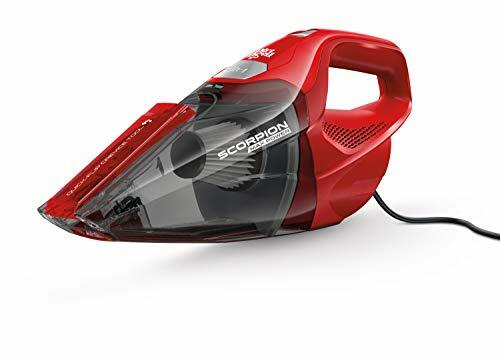 The Dirt Devil Scorpion is a great vacuum cleaner if you usually have an outlet nearby. The dirt cup is big enough to clean out the truck and trailer in one load. It would’ve been sweet with a 12v connection on this for easier use in the truck but unfortunately, the plug is a 120v. In my opinion, it’s a pro that it’s corded, as you won’t have to worry about the battery running out and the vacuum losing suction due to low battery life. The suction power is also very important when you want to get rid of pet hairs. A vacuum cleaner of this size is great for even smaller pet cages like guinea pigs. In addition to the onboard crevice tool, an attachable hose is also included. The Bisell Pet Hair Eraser might make it sound like it’s only good for pet hair, but you can also use this to clean up dust and dirt. The reason it’s called the Pet Hair Eraser is due to how the nozzle is designed. It’s a rubber nozzle with spikes, designed to attract hair. It also comes with a regular suction nozzle. With 0.78 L dirt cup capacity, it has the biggest dirt storage in today’s comparison, so you can fill it up with a lot of hair and dirt before it needs to be emptied. When the time comes, it’s as easy as removing the dirt cup and emptying it into the trash. The screen inside the cleaner is easy to rinse off with some warm water. Bisell’s vacuum comes with a 16 ft power cord so it’s a great option for the car. Since there is no extendable nozzle, it might not be the best option for the RV to clean the floor and areas you can’t reach. At 5 lbs, it’s somewhat heavy compared to other vacuum cleaners we’re looking at today, so take that into consideration. 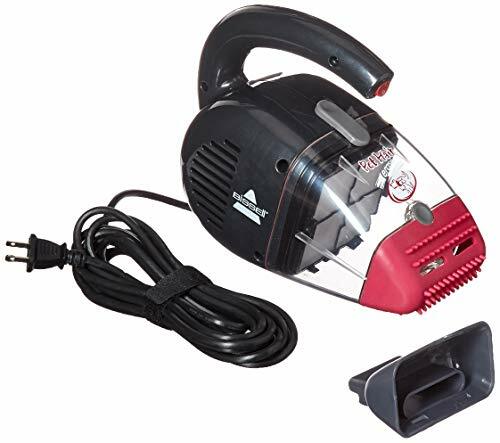 I recommend the Bissell Pet Hair Eraser for cleaning up pet hair in the truck or trailer, but not as an all-around vacuum cleaner. You could always have a duster or a brush to sweep up the dirt and then use this vacuum to clean it up, so I’m not saying you should disregard this as a vacuum cleaner for the RV. But I believe there are better options when you need to clean bigger areas. Next up is the portable handheld vacuum that I currently own, the Black+Decker CHV1410L. This is a cordless vacuum which means that it runs on a battery and limits the amount of time you have to clean. It also makes a difference in suction power. It starts out pretty strong, but as it loses battery it loses suction power and when 15 minutes have gone by, the suction power is pretty much gone. When the battery has run out, it needs 4 hours on the charger to be ready again. The lithium ion battery makes sure you get the most suction power and the longest cleaning time possible. The dirt cup holds up to 0.6 L of dirt but is really easy to empty when the cup is full. Remove the nozzle and pour out the dirt. If the filter is dirty, you can take apart the whole dirt cup base and rinse all non-electrical items under warm water. I do this every time I empty the dirt cup, making sure that I get the best possible suction power. What I really like on the CHV1410L is the several built-in features. It has a crevice tool that lets you extend the reach and get into tight spaces, a flip-up brush for certain areas, and a nozzle that rotates 180 degrees. So why did I buy the BLACK+DECKER CHV1410L and what’s good about it? I really like the built-in nozzles, how easy it is to clean, the suction power before 15 minutes have gone by, and how portable it is. Note that it’s the lightest vacuum cleaner in today’s comparison, at 2.6 lbs. As always, longer battery life would’ve made it even better, but for now, this is where battery technology is at. If all you need this for is the car though, it’ll do a pretty good job, but not on the carpet. 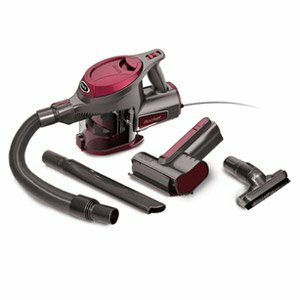 If you want suction that is strong enough to clean the carpet, I recommend going with a corded vacuum or a more heavy duty cordless model like the Dyson below. SharkNinja is a known vacuum cleaner brand and they make this Shark Rocket. It’s a portable and lightweight corded vacuum cleaner with a 15 ft power cord. Although it’s relatively big, it only weighs 3.7 lbs. Where SharkNinja has done an extremely good job with this vacuum is when you take a look at the included accessories. You’ll get a dusting brush, a 12” crevice tool, a motorized brush made for pet hair, and a stretch hose that you can connect the crevice tool to so you can reach tight spots. The dust cup is easy to empty and clean, although somewhat small at 0.46 L capacity. The filters are washable and reusable which is great so you don’t have to go buy new filters every other month. So who is the Shark Rocket for? Well, it’s a very capable vacuum cleaner for cleaning both the truck and the trailer. With several attachments to choose from, you can cover a lot of areas and different kind of furniture. Being corded instead of cordless, you don’t have to worry about suction power disappearing as long as you have access to electricity. The motorized brush for pet hair will clean your carpet and furniture with ease. It’s a great all-around cleaner. 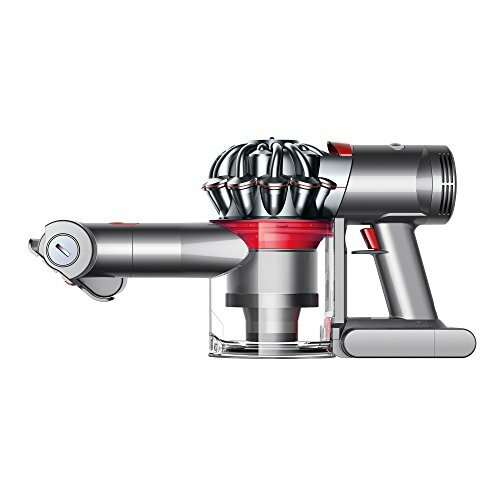 Last up is the Dyson V7 Trigger. Dyson is a very well-known vacuum cleaner brand that is really pushing what a vacuum cleaner is capable of. They have several products that are cordless and handheld with impressive battery life and suction power. The V7 Trigger is no exception. With 30 minutes of fade-free cordless suction, it’s one of the best portable cordless vacuum cleaners on the market. The long battery life is possible due to the use of lithium-ion batteries that are lightweight and capable of fast discharging and charging. Dyson has also created one of the best dust cups that is extremely easy to empty. Pull a handle on the top of the vacuum and the bottom will open up and dirt will fall out on its own. No need to take the vacuum apart and risk getting dirt all over the place. The dirt cup has a capacity of 0.56 L and the vacuum weighs 3.7 lbs, just like the Shark Rocket. The included mini motorized tool does a great job on pet hair and ground-in dirt, so it’s great for cars and RVs. The included crevice tool will let you get into tighter spots and into furniture like couches with ease. So is the Dyson V7 Trigger the best portable handheld vacuum cleaner for everybody? Well, it depends on what you need. Is 30 minutes of cleaning enough for you? Do you have access to electricity most of the time? Would it be your main vacuum? If you have access to electricity most of the time, I would go with a corded vacuum. Although the Dyson has the best suction power when looking at cordless vacuums, corded vacuums have better suction power in general. You’ll have to decide if it’s worth the extra money for a cordless instead of a corded, depending on your situation. I also want you to have realistic expectations when it comes to cordless vacuums. To have the same suction power even for a couple of minutes you could have to pay possibly twice as much compared to a corded one. Here’s the thing when it comes to finding a good vacuum cleaner, you need to consider what you need and where. Before you decide, I advise you to read below about what to consider when buying a handheld vacuum cleaner. The most important thing to consider is whether you want a corded or cordless one. Corded: Shark Rocket – The Shark Rocket has left a great impression on me with its features and included accessories. 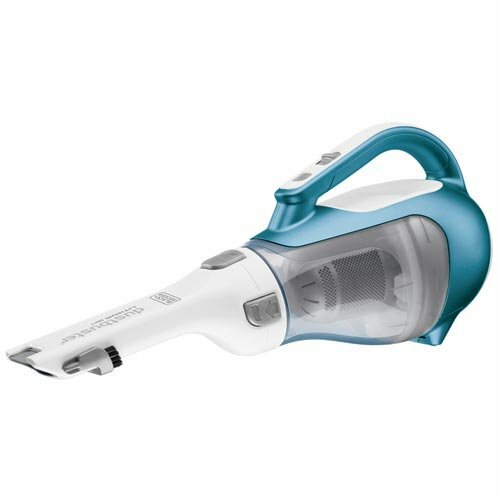 It’s a great all-around vacuum cleaner that is capable of cleaning cars and RVs. Its versatility makes it my favorite corded handheld vacuum cleaner. Cordless: Dyson V7 Trigger – I have to give this one to the Dyson V7 Trigger. Although I didn’t give it much competition in today’s comparison, it’s one of the best cordless vacuums on the market. It might appear that Dyson is releasing new vacuums every other day, but with each new product, there’s something new and innovative. They’re great vacuums but at a cost. Corded Vs. Cordless – The first thing you should decide is, does your vacuum need to be cordless, or is a corded one fine? There are limitations to both. A corded vacuum requires electricity, but when you have it, you can vacuum for as long as you need. A corded vacuum will also have better suction compared to a cordless vacuum if you spent the same amount on both. A cordless vacuum will have the portability some people want, but you’ll lose suction and be limited in terms of battery life. I have read reviews by people that expect way too much out of a cordless vacuum and end up disappointed. Right now a cordless vacuum will have limited battery life and suction power and take several hours to charge. Weight – How are you going to be using your vacuum? Are you going to carry it around, or is it just to clean the car so you can rest it on the seats and the floor a majority of the time? One pound weight difference doesn’t sound like a lot, but if you’re carrying it around for 20 minutes you’ll start to notice the difference. Nozzles – Do you have a pet and struggle with pet hair all over your furniture and carpet? Strong suction with a good nozzle will be important. A corded vacuum will have better suction and a great nozzle will make sure there’s no hair left behind. If you need a vacuum to clean tight spots, a slim nozzle is preferred. Some vacuums include one, while some don’t. Stick – The vacuums we’ve looked at today are not stick vacuums and are meant for handheld use most of the time. If you’re looking for a vacuum to clean floors with and occasionally clean your truck and tight spots, I recommend taking a look at my article about the best vacuums for RVs. Is a cordless vacuum going to have enough suction to clean carpet? Here’s the thing, if you want to get a cordless vacuum that will do clean carpet as good as a corded one, be ready to pay double. There are cordless vacuums that do a great job on carpet, but the equivalent corded option will be cheaper. How can a vacuum cleaner be bagless? Even though a vacuum cleaner is bagless, your dust and dirt have a place to go. Bagless vacuums have bins that are easy to empty and clean. The biggest advantage they have compared to regular vacuums with bags is that you don’t have to go buy new bags just because you want to empty your vacuum. Open the bin, empty the dirt directly into your trash can, and you’re done.